Los Angeles, we have a problem. A season that started with nothing but optimism has quickly spiraled into a whirlwind of under-performance, coach questioning, and rumors, as the Lakers are currently the 11th seed in the West, six wins below the Spurs, who are currently holding onto the final playoff position. What is more discouraging is that they have won only five of their last 18 games and the chemistry is visibly mediocre, to say the least. LeBron’s defense has come into question, and for valid reasons, as at times he seems disinterested on that end of the floor. The only player that seems to have come alive, proving me completely wrong in the process, is Rajon Rondo, but the Lakers have a long way to go. It is going to be a very interesting summer for them and I expect many changes both in the coaching and player personnel. Apart from Rondo, last week’s buy suggestions of Joakim Noah and Tyus Jones were also misses, as the former saw his minutes reduced and the latter disappeared due to the return of Jeff Teague. On the contrary, Luke Kennard is starting to look like a must own player and I encourage you to hurry and get him because he won’t be available for long. Finally, both sell candidates, Harrison Barnes and Justise Winslow, have not done anything to convince me that they should be removed from the trading block of your team. A month or so ago, in this very fantasy corner, a young center of the New York Knicks was featured as a buy candidate. 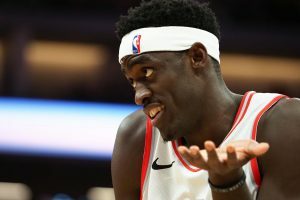 He began the year as the 3rd option behind Enes Kanter and Luke Kornet and had the occasional foul-plagued game but, and I’m quoting myself from the aforementioned article, “As long as he can stay on the court, he is both a great stash for the second half of the season and immediate help for boards and blocks.” I hope you took that advice because the second half of the season is upon us and Mitchell Robinson is beasting, averaging 10.3/0/8.2/0.4/0.8/3.3/0.4 on 71%/62.5% shooting. The blocks are outright RIDICULOUS! He even improved his per-36 stats and with DeAndre Jordan’s contract expiring this summer, he is already very high on my draft board for next season. When taking a quick look at last article’s suggestions, Dion Waiter’s name pops out as the big hit, as he is having a great scoring month both from the paint and from beyond the 3pt line. The duo of Landry Shamet and Allen Crabbe have contributed in points and triples, with the former offering higher rest of season upside. Finally, Tobias Harris is proving me wrong by keeping his usage in Philly and scoring at his usual clip. This is a situation to monitor going forward, and we have to take into account that Joel Embiid was sidelined, but my projections of a top 50 finish look a bit pessimistic now. I’ve got to admit. I was a D’Angelo Russell hater before he came to the Nets. The incident where he exposed Nick Young as a cheater by filming him, talking about it, and posting it on social media made me think he was kind of a bonehead and a snitch. I also thought he was a guy who would never meet the expectations of being the number two overall draft pick. I also, was not a fan of his game from a fantasy perspective. He turned it over too much and he had poor shooting percentages, both from the field and the line, while contributing almost nothing in the way of D stats. However, since being traded to the Nets I have changed my tune on him, especially this season. He made a huge improvement in his FTs, going from 74% last season to 81.8% this season. He also upped his assists by 1.5 while not adding too many turnovers, and upped his scoring by nearly 5 points. He has also shown the ability to absolutely take over games and last night was one of those nights. D-Loading went 6-40-1-7-2-1-4 on 14-of-31 shooting and 6-for-6 from the line. It was also his 23rd birthday, so as a Nets fan I felt compelled to give him the lede. It’s hard to believe he’s already a four-year veteran, but that’s what happens with these one-and-done guys. They also can take some time to fully download. There was a huge slate of games last night so let’s dive on in to the daily notes!